I’m the type of girl that shies away from trends. For example, way back when every girlfriend of mine was in love with Brad Pitt, I fancied Angelina Jolie. And when everyone was getting diamond earrings for their birthdays, I was psyched about my new shiny design books. So when the whole world went zoodle-crazy, I sighed and made myself a bowl of Quinoa Mac & Cheese™. But sometimes, it can be impossible to avoid trends completely. The other day, I was having dinner at my friend’s house and she served a bowl of pesto zoodles, a current internet-wide craze. And what do you know? The stubborn me realized that some trends are actually worth following. They’re trends for a reason, after all. What surprised me even more was that I liked those zoodles so much, I made them a few days later. And then again the following week, changing the nuts but keeping the noodle “authentic”. And as much as I do not want to admit it, I have finally embraced a trend! Now on to the recipe. If you think these zoodles will taste like noodles, think again. However, this is a healthy eating blog. We don’t do noodles (well, at least not that often.) So adjust your expectations and think HEALTHY, LIGHT, VITAMIN-RICH rather than cancerogenous, gut-wrecking, waist-expending. Prepping the zoodles is really easy. Shred the zucchini (I use this shredder because it works well and looks great in the kitchen, saute them quickly—the key word is quickly, as the more you cook them the soggier they get—drench them in the sauce and… try not to be greedy and eat the whole bowl on your own! A bit of warning though, one shredded zucchini looks like a lot but it really isn’t (45 calories only.) So unless you are serving it with a big chunk of protein on the side, you might want to shred 2-4 for the whole family. Prepare the pesto: Combine all of the pesto ingredients in a food processor and blend until completely smooth. For a chunkier texture, instead use the pulse function on your blender or food processor to gently mix the ingredients together. 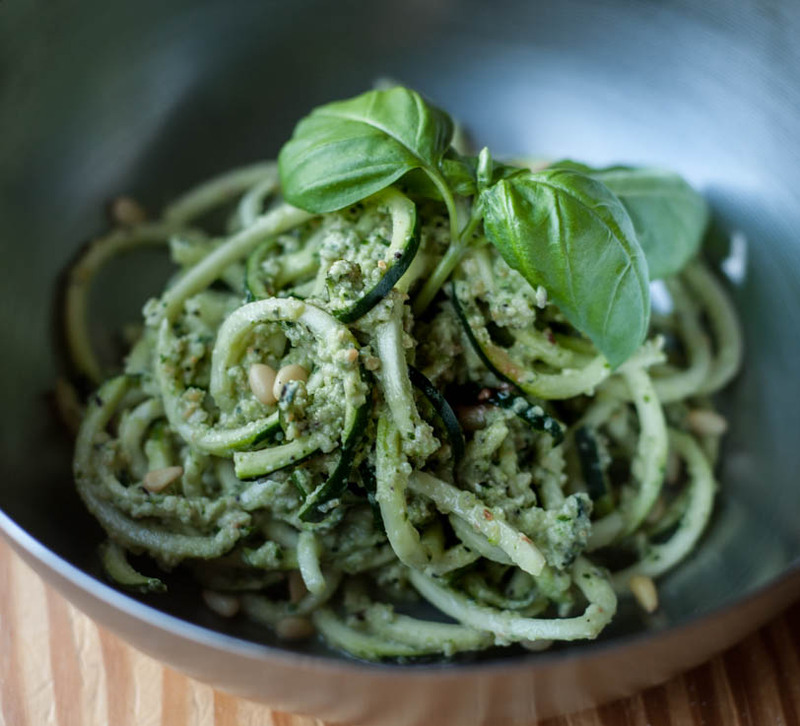 Use a spiralizer to create “noodles” out of the zucchini. 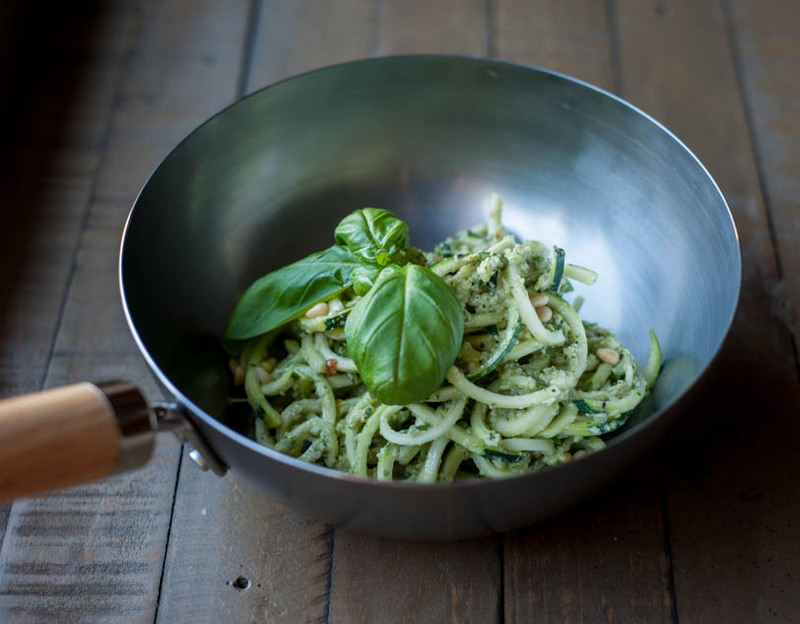 For a warm dish, melt the coconut oil in a large skillet over medium heat and sauté the zucchini “noodles” until tender, about 3 to 5 minutes. Add in the pesto and stir quickly, just enough to warm the sauce, about 1 minute. Serve warm, with a sprinkle of pine nuts. 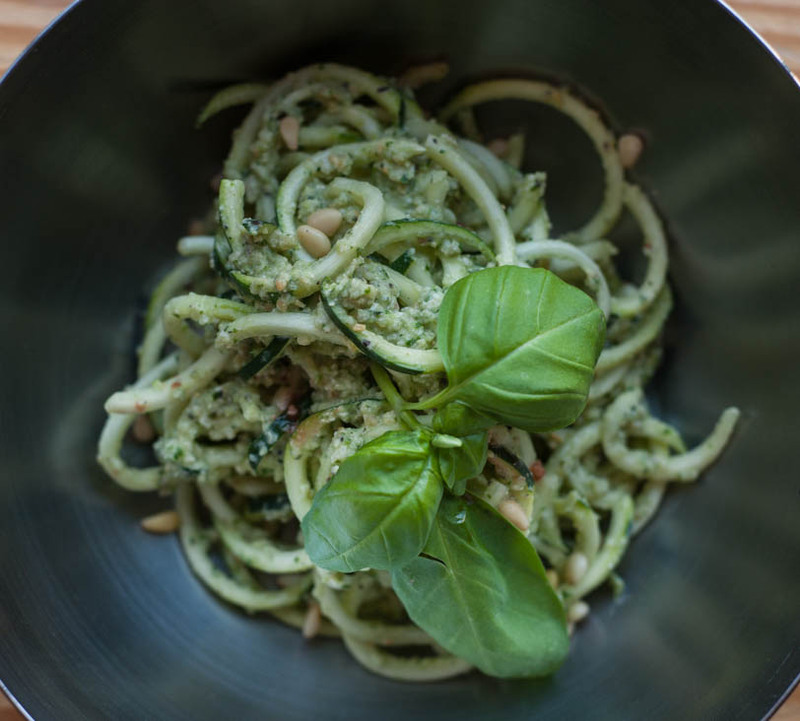 For a cold dish, simply toss the raw zucchini “noodles” with the prepared pesto and top with the pine nuts. My absolute favorite wine with pesto is Grgich Hills Estate Napa Valley Fumé Blanc. It’s full bodied and balances the pine nut purée in the pesto impeccably.